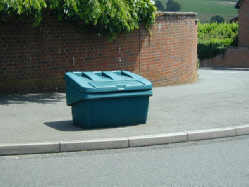 In 2010 Uckfield Town Council agreed that it would no longer provide grit bins or fill existing bins in the town. 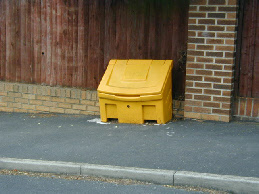 The Council would however, offer the existing bins to Resident Associations or community groups free of charge. These groups could then purchase the grit from the County Council and control the use of the grit. A number of residents have already formed associations in Uckfield and have obtained the relevant licences and permission. East Sussex County Council currently have the following scheme. there is a suitable location for the new bin. You can also request a grit bin through the Highways Contact Centre. They will review the request and, if approved, agree a suitable location. Bins can be located on the highway, private or Council owned land, with the landowner's permission. New grit bins are not automatically refilled. The owner or responsible person must ask for a bin to be refilled by contacting the Highways Contact Centre and making an advance payment. They will then arrange for the new bin to be refilled when they refill their own grit bins. When there is high demand for grit, this may be reserved for use on priority roads and this might prevent grit bins from being refilled. Safety is the most important factor. Only spread the grit when there are no vehicles or pedestrians nearby. Wear bright clothing so that you can be seen easily. Don't assume the road or pavement is safe just because it has been gritted. Look after the environment – use the minimum grit necessary. A shovel full of grit will be sufficient for 20-30 square metres of road.